Once upon a time there was a group of people who loved their game and wanted to enter a team that would represent their community by competing against other communities . They formed a club, appointed a coach and signed players. And one day they grew up to be FC Barcelona. Or the Green Bay Packers. Or the Saskatchewan Roughriders. And now, here in sleepy little Victoria the return to grassroots ownerships has now come to our own Highlanders Football Club. At a packed meeting in early November Alex Campbell, founder and owner of the Victoria Highlanders outlined his plan (.pdf file) to take the club into the future as a community asset. Giving up a large percentage of his ownership, Campbell proposes handing over 30% of the club to local soccer associations and another 30% to season ticket holders who will be able to vote on some club issues and elect two members to the executive board. This move appears to be part of Campbell's vision for the club as an integral component of the path for local player development. A crucial bridge between youth teams and the professional career for young players. A key element long missing in our local and national soccer community. From a fan perspective it means being part of a club in a way seldom seen in the modern sports world. 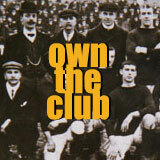 Fans often feel their club "belongs" to those who pay for tickets and sit in the stands. In this case it will be true. Season ticket holders will have more than just an opportunity to watch the best football players in our community they get to become "owners" of the club. The team also announced that the price for this new Season ticket/ownership will be less than last season and will include all Women's team games as well. Get your ticket now and OWN THE CLUB!